Female Bodyguards for the Pope? Well, it seems that women are now being considered for the Swiss Guard at the Vatican. The Swiss Guard are the Pontiffs personal security force. Female Bodyguards for the Pope would be an interesting leap for the Vatican. 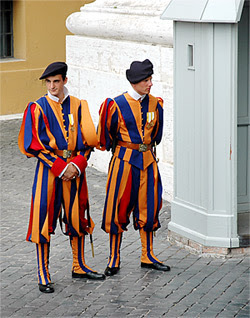 They wear the same silly little uniforms for the last 500 years, and keep the pope safe. In fact there have been times where they have been ambushed and lost most of the whole team but were able to keep their principal from harm. “After 500 years of exclusion, the Vatican is considering whether to again allow the entry of women in the Swiss Guard, the personal guard of Pontifika, composed exclusively of Swiss Catholics between the ages of 19 and 30 years. The garrison, now ceremonial in nature, «born» on 22 January 1506, when 150 mercenaries arrived in Rome to serve the Pope in July II. The problem likely to face policy makers is to find accommodation after already experiencing space problems”. Situational Awareness Skill or Instinct? Do you Train for Success or to Impress? What kind of a security business leader are you? All for one, one for all….can you work and live by this motto?